NTK Marine Golfe Juan exclusive dealer of VanDutch Yachts. Currently present as a broker on the Port Camille Rayon in Golfe Juan (06), the company NTK Marine is the exclusive reseller of yachts of the VanDutch brand, a true day cruiser that offers a very friendly cockpit. Also specializing in the rental of luxury yachts, NTK Marine offers you boat rentals around Cannes , Monaco, St Tropez and all the French Riviera to relax with family and friends, or maybe even organize a wedding on a yacht, a successful event for unforgettable memories ! 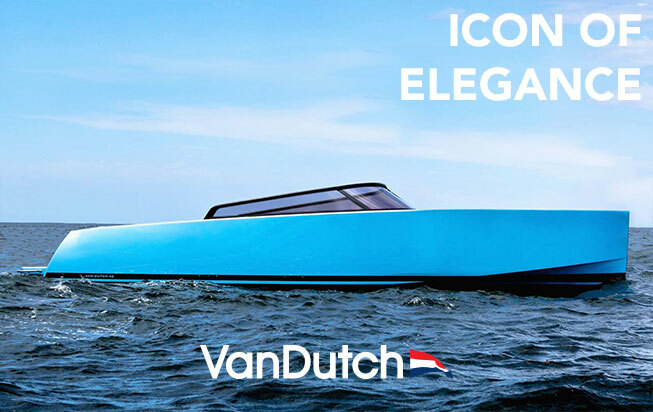 The brand ” VanDutch Marine” is originally a contraction of ” VanGuard Dutch Marine “: a summary of the best vanguard technology in the Dutch yacht building. This Dutch yard of strong reputation earned its fame for the finished quality of its boats and for their unique and innovative design. Initially, the challenge was to build a day-boat as light as it would be strong, fast and above all economic. To achieve this goal , all the latest technology was necessary. The hull and deck are composite “sandwich” built type , utilizing the technique of vacuum injection, reinforcing the strength and lightness of the boat. Strategic points of the boat were reinforced with Kevlar. A « V » shape drive shaft line was chosen for VanDutch vessels , allowing aft boat thereby increasing the speed and reducing fuel consumption. Since the production of the first boat, VanDutch Marine has extended its range with the VanDutch 30, the 55 and the VanDutch 40 Walk Around. The VanDutch stands out for its quick acceleration and ability to turn short. A speed approaching 40 knots can be achieved through the different engine types are offered. The engine power is transmitted directly from the shafts to propellers of high performance, through tunnels specially designed for this purpose, providing an almost perfect horizontal angle. To maneuver the VanDutch is simple, especially with bow and stern thrusters as standard equipment. Moreover, in addition to this equipment, an autopilot associated with a GPS card reader allow a peaceful boat control. Frank Mulder has so often been rewarded, including by the prestigious International Superyacht Society, he does not need any introduction. His pencil stroke is synonymous with performance and seakeeping excellence. The VanDutch is distinguished by the intelligence of its underwater structure , exceptional comfort with a hull that does not slap the water and get you wet. The huge cockpit, protected by a large windshield, enables easy navigation even at high speed and in comfort and style. In 2013, the World Yacht Trophies rewarded the VanDutch 55 Best Design for boats measuring up to 24 meters, evidence VanDutch has imposed its style in the world of boating. VanDutch combines performance with sleek design. In the cabin, the solid surface material « Corian » was chosen to provide a quality finish and durability. The volumes of the cabins are different for each model; they can accommodate from 2 people in the VanDutch 30 up to 10 people inside the VanDutch 55. Air conditioning, heating, a powerful sound system, a microwave and refrigerators are standard equipment. The VanDutch 40 and the VanDutch 55 both have a fully equipped bathroom with electric toilet and hot/cold shower, the VanDutch 30 is equipped with only a marine toilet. The Esthec outer covering of the deck offers all the advantages of teak minus the disadvantages of maintenance, plus a multitude of color combinations blades and joints. The layout of the deck includes , among others, retractable cleats, very large chests, a hydraulic opening engine compartment and a telescopic navigation light. The stainless steel swim ladder and a compartment for fenders, perfectly built in the deck, help to enjoy the incredibly sleek design of the cockpit.